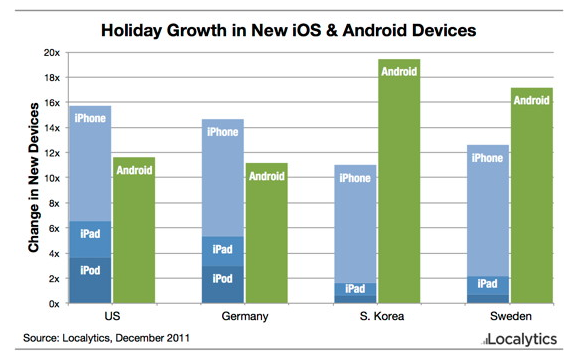 Apple’s iOS (s aapl) devices were popular gifts during the holiday weekend, as you might expect. According to a new Localytics study, there were 12.5 times more devices accessing games and apps using the Localytics platform than during previous weekends, in fact. It was enough growth to beat out Android’s(s goog) worldwide gains, but not by much. Regional differences in some areas showed strong discrepancies between the growth rate of the two platforms. In Germany and the U.S., for instance, iOS far outstripped Android’s growth, with around 15 or 16 times the average new device activations, vs about 11 to 12 times for Android hardware. The iPad and the iPod seem to make the difference; in countries where iOS beat Android, there were many more of both devices activated. In the U.S., Localytics saw 21 times more iPod touches activated than usual, vs 14 times more iPhones, for example. Android did very well in Asia and parts of Europe, while Apple dominated in key markets like the U.S., the U.K. and Germany. Of the top 20 countries in terms of mobile device popularity, Google’s mobile platform grew more quickly in 14; still, Apple pulled ahead overall, since Android grew approximately 12 times faster than usual v. Apple’s 12.5 times improvement. Localytics compiled the data using information from its mobile analytics platform, which is in use on more than 200 million devices worldwide via its development partners. Any thoughts on the methodology and validity of the study? Any past studies of the credibility of Local Analytics studies? Agree with other posters here–if data are representative, they show Apple doing incredibly well, much better than the Apple bashers, Droids every admit. Note to web site… your comment window pane has an oddity that some others have. If you’ve gone back to edit something earlier in your comment, you CANNOT click at the end of the message! You have to press the down arrow! It’s VERY irritating. The Washington Post has the very same problem (probably the same commenting engine). Hope you all can fix it! Oh boy. You had to search long & hard to find two countries where Android best Apple. Sweden & South Korea. I can why S. Koreas- Samsung’s home base. Don’t care to find out why Sweden. Does it really matter? In four weeks, we’ll get the holiday season’s earnings report and then we’ll see that Apple’s by far the true winner. One company’s sales staying on par with a dozen or so companies combined isn’t too shabby at all. People say that Android is winning but never break down how many Android device vendors actually making profit from sales. The iPod Touch hasn’t even been upgraded for over a year and sales are still decent. I’d definitely say that Apple is holding its own against the hordes of Android device vendors. Hopefully, Apple will continue to sell every device it can make. I’d expect S. Korea to have high Android smartphone sales considering Samsung’s national influence in the country. I hope Apple continues this pace well into 2012 and beyond and is able to expand production capacity.